Lisa was looking for a recipe to utilize the rest of our veggies from the CSA box, and came across this recipe from Food & Wine Magazine. Potatoes and broccoli are the big players here, with a supporting cast of mushrooms, tomatoes, and basil. The green curry paste we had on hand was pretty subtle, but still added a nice flavor to the dish. Hot damn, I like this! What? It’s not hot at all. The flavor is really good though. I like these generous portions… Hm, guess what I’m having for dinner tomorrow night while you’re at school? In a large saucepan, heat the oil over medium heat. Add the onion and ginger and cook, stirring occasionally, until starting to soften, about 3 minutes. Stir in the curry paste and fry, stirring, for 1 minute. Add the coconut milk and broth and bring to a boil. 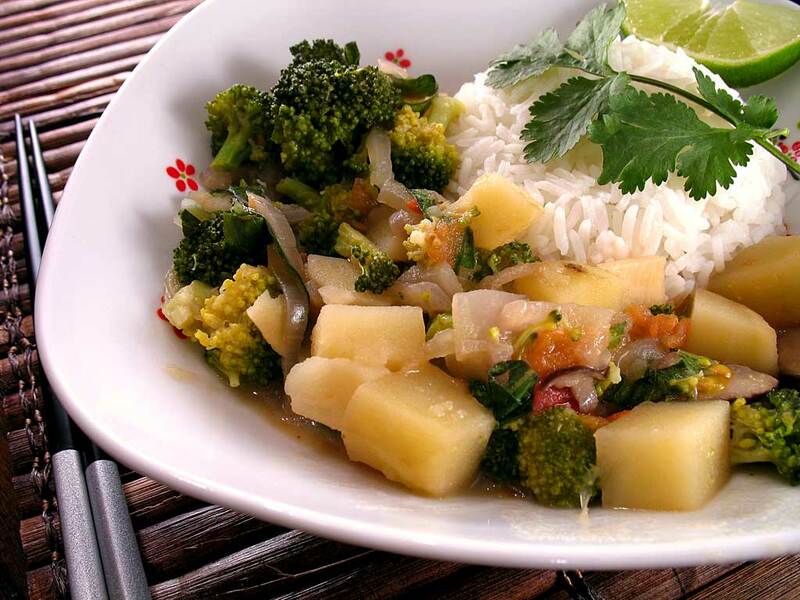 Stir in the soy sauce, brown sugar, salt, bamboo shoots, potatoes, broccoli, and mushrooms. Reduce the heat and simmer, partially covered, until the vegetables are tender, about 10 minutes. Stir in the tomato and heat through, about 2 minutes. Remove from the heat and add the lime juice and basil. Copyright © 2008 We [Heart] Food. All rights reserved.